Ford is creating a new exhibit to give the public an opportunity to see this growing collection of Michigan Central Station artifacts. Cast iron elevator buttons pictured. In December 2018, Bryan J. Brincat dropped off several items in a construction trailer outside Michigan Central Station. Within the trailer there were items ranging from cast iron wall sconces once positioned by the station’s elevator doors, cast iron decorative pineapple railing toppers, and cast iron elevator buttons. These artifacts are now back where they belong. The timing couldn’t be better, as Ford announced plans to purchase the iconic train station in June, 2018. Ford plans to make the station a centerpiece of a new mobility campus. 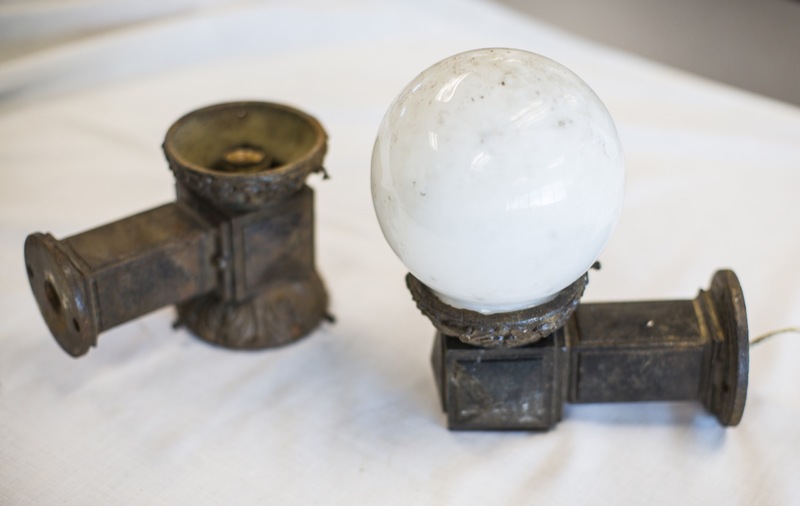 According to Ford, residents from Metro Detroit and beyond have brought back a variety of artifacts and decorative parts taken from the historic building during the three decades it was abandoned. Art deco antiques ranging from old mail chutes to fountains and light fixtures are not only assisting Ford in its preservation efforts, but they also play an important role in linking the station’s past to its future. Ford is creating a new exhibit to give the public an opportunity to see this growing collection of Michigan Central Station artifacts. Cast iron wall sconces pictured. Looters may have left their mark, but with the help of the Detroit Historical Society, Ford is making efforts to create a new exhibit and give the public an opportunity to see a growing collection of these Michigan Central Station treasures. In addition to the latest returned items, the new display will feature the beloved clock that once hung proudly outside of Michigan Central Station. Ford is creating a new exhibit to give the public an opportunity to see this growing collection of Michigan Central Station artifacts. 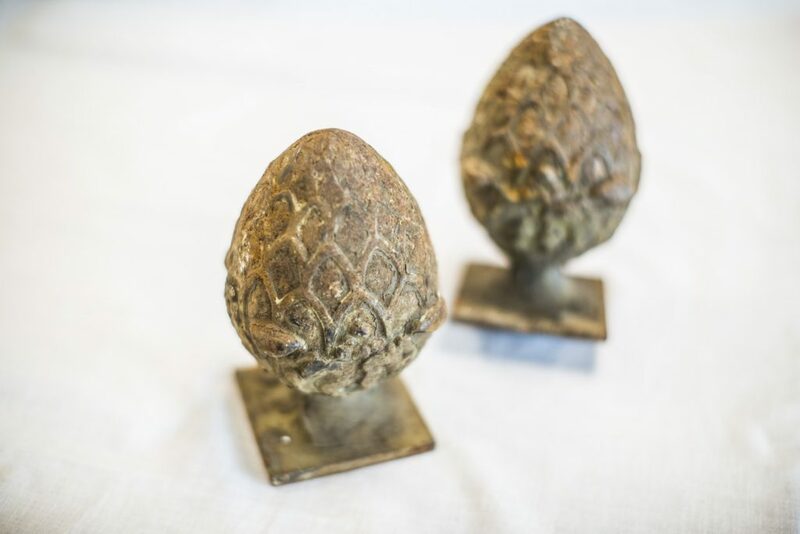 Cast iron decorative pineapple railing toppers pictured. These Michigan Central Station items will be incorporated into Ford Motor Company’s overall collection of treasured antiques, artifacts, and otherwise historically relevant items that will be preserved and properly cared for. The new exhibit will be on display at Ford’s Michigan Central Station Winter Festival, a 10-day outdoor event to be held this month in conjunction with the North American International Auto Show. The festival will be free and open to the public, beginning January 18. It will feature a 3D projection light show on the exterior of the building, live entertainment, music, artists, food trucks, and activities for all ages. I have owned 65 different brand of cars. My first one was a 1948 Ford, and my last one a 2019 Ford Escape. Some of interest over the years; 1953 Mercury, 66 Shelby GT350 (2) of them, a 1966 289 Cobra(raced at Lime Rock Raceway in Connecticut),1966 Mustang, 1967 Mustang, 1969 428 Cobrajet Mustang, 1969 Lincoln Continental, Mark 111, (way ahead of it’s time, drove beautifully) with a 460 ci V8 in it. and also many Ford powered vehicles. I’ve alaways liked Ford vehicles, and continue to do so. In 2014, after driving many new cars, I chose to purchase a 2014 Ford Escape Titanium, great car, then I did something I don’t usually ever do, in 2019 I purchased another Ford Escape Titanium, (because the 2014 drove so well, I did purchase another one 2019 Titanium, (different color though). I didn’t think that FORD could make the car any better, but they did, and this new 2019 is the best ever, I could hear, and feel the difference when I first drove it, Thanks Ford for making my automobile life very interesting and so enjoyable. P.S. I almost bought a 2019 Jeep Cherokee, that was my 2nd choice. And I swore I’d never own a 4 cyl, car, but after driving the 2.0 turbo (240 HP), it felt like a small V8 in performance, My only dislike, was that with the Titanium model, you are forced to have a moonroof, with Jeep it’s an option.